Time audit helps you and your team find and fix faulty time entries. 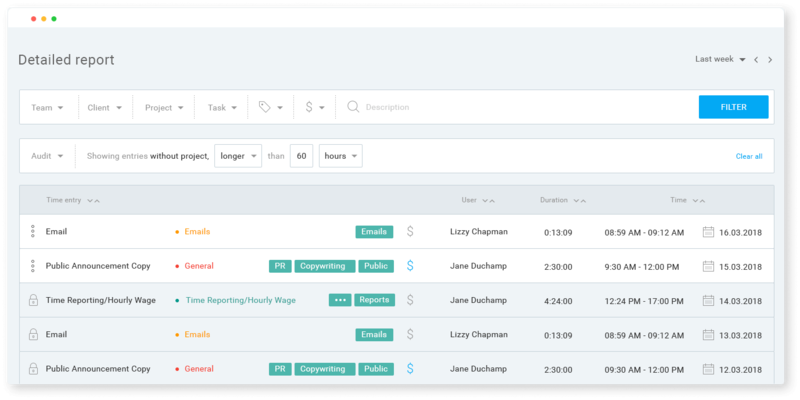 Time audit is an extra feature, which you can enable by upgrading your workspace. When you’re in the middle of something, you just want to start a timer and add a project/categorize the entry later. When you need to clean up timesheets before invoicing clients and you need to find entries that your team forgot to categorize. Find time entries you’ve made by accident (shorter than 1 minute or longer than 8 hours) so you can delete them. You can also use filters on top of the audit. When you select ‘Suspicious duration’, you can define the duration that makes an entry suspicious.